Blurb- Years later … on Facebook is an anthology of short stories and Middles... the sheer joy of writing and… life with its funny and complicated happenings... Find out what transpired when a guy encountered a childhood flame after several years.... and when a career woman peeped out of marriage,...... another tale of love amidst firing on the Indo-Pak border..... and a young man stuck in the time warp of his teenage love… and about a girl who walked into a gym…. and relationships in the present cruel times of Love-Jihad. 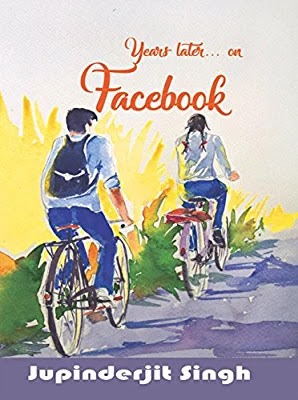 Review- Years Later... On Facebook is anthology book penned down by Mr. Jupijderjit Singh consisting of short stories with unpredictable twists and turns. Book Title and Cover- Title is appropriate with the book. Cover is designed well and catches the attention of readers. Blurb is short and interesting. Overall First Impression of our book is good. Language and Writing Style- One thing which you will notice while reading the book is impeccable and vast vocabulary of Mr. Singh. Language used is impressive. Writing style is beautiful and all the stories are narrated well. Overall, Years Later... On Facebook is combination of impeccable language, decent narration and unexpected twists. I would recommend this book to everyone who are looking for some quick read.